Edward Hopper's Nighthawks (1942) doesn't just evoke a certain stripe of mid-century, after-hours, big-city American loneliness; it has more or less come to stand for the feeling itself. But as with most images that passed so fully into the realm of iconhood, we all too easily forget that the painting didn't simply emerge complete, ready to embed itself in the zeitgeist. 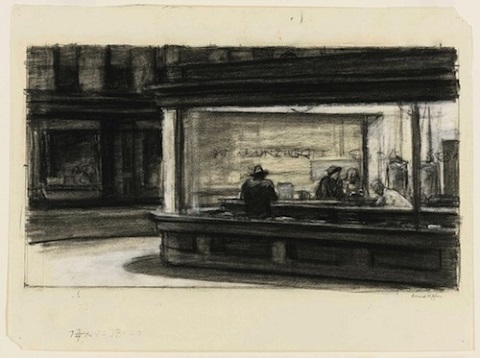 Robin Cembalest at ARTnews has a post on how Edward Hopper "storyboarded" Nighthawks, finding and sketching out models for those three melancholic customers (one of whom you can see in an early rendering above), that wholesome young attendant in white, and the all-night diner (which you can see come together in chalk on paper below) in which they find refuge. 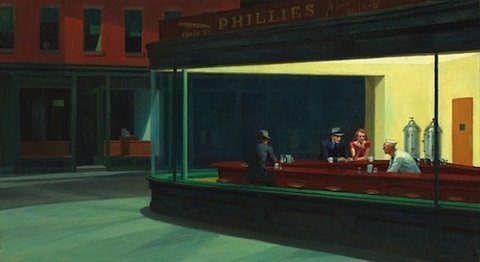 Despite how many elements of the real world Hopper studied to create Nighthawks, it ultimately depicts no real place. The painter himself posed for the male figures, and his wife modeled for the female. As for the locale, seen in the final drawing just above, Cembalest notes that "after years of research and scholarship, experts have determined that Nighthawks was not inspired by one specific diner. Rather, it was a composite of wedge-shaped intersections around Greenwich Avenue. Its curving prow seems partly inspired by the Flatiron Building." In a way, it almost seemed too realistically New York to actually exist in New York. Hopper painted a distillation of a sense of American place, and like many American places, I've never quite known whether I'd love to drop in at the Nighthawks diner (though I'd have to find a front door first), or whether I should count myself lucky that life hasn't relegated me to it. 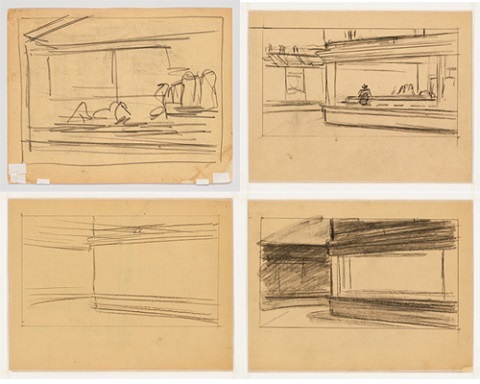 You can learn more about the fascinating storyboarding of Nighthawks at Art News and see many more sketches. 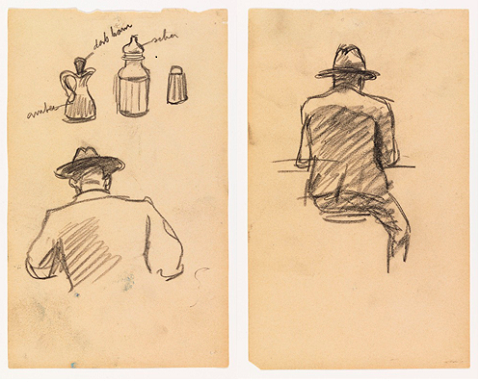 Speaking of the sketches, they come courtesy of The Whitney Museum of American Art. Of course everyone focuses on the right hand side with the main diner. After many viewings I focused on the left hand building front in the background. There’s the ‘missing door’ of the diner sneaking its way in. That door and side windows represents a fairly common early half of the 20th C. Hopper used it 12 years before in his hypnotic 1930 Early Sunday Morning. Ironically I had a studio in upstate NY in Milton NY with nearly the same building exterior. That building was featured in Brando’s 1960 film The Fugitive Kind that was a stand in for a dusty Southern town. Be amusing to know whether Hopper, big cinema fan, was aware of the movie and its iconic look. In his review in The New York Times, Bosley Crowther described the film as a “piercing account of loneliness and disappointment in a crass and tyrannical world . . . [Sidney Lumet’s] plainly perceptive understanding of the deep-running skills of the two stars, his daring with faces in close-up and his out-right audacity in pacing his film at a morbid tempo that lets time drag and passions slowly shape are responsible for much of the insistence and the mesmeric quality that emerge . . Nothing to do with the Flatiron Building. It was a restaurant on Seventh Avenue in Greenwich Village. I ate in it, back in the 70s. That piece of curved glass was terribly impressive. This is so neat! Shows how the idea starts! Awesome!